David Beckham, his pregnant wife Victoria Beckham and all their three sons are huge Justin Bieber fans. Last week David said Romeo, 8, had asked his parents to name the unborn sister Justine Bieber after the Canadian pop star. When we got [initially wrongly] told it was a boy, my middle son Romeo said, ‘How about Justin Bieber as a name? Justin Bieber Beckham?’ So now we know it’s a girl, he said, ‘Well, how about Justine Bieber Beckham? '” David told Jimmy Kimmel. Now we also know that apart from having all JB’s CDs, the Beckhams also have his life-size cut-out in their family. 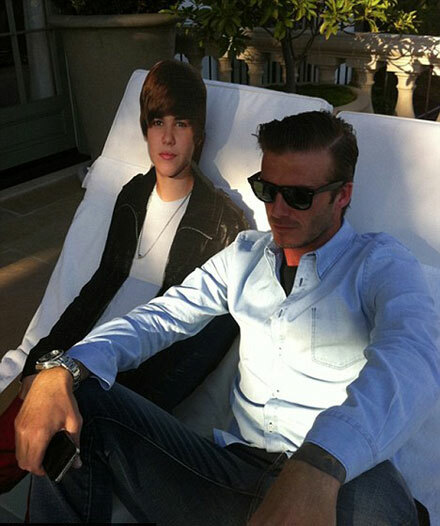 Victoria posted a pic on her Twitter page that shows David sunbathing alongside Bieber’s cardboard copy. OMG!!! !a visitor just arrived!!! !Guess who????!!!!! And now he is sunbathing!!!!!!! He took my sunbed!!!!!!x. Vb” Victoria tweeted. First Kim Kardashian, then Rihanna and Katy Perry, Avril Lavigne and Willow Smith, and now the Beckhams – the Bieber Fever is a pandemic! Have also caught the Bieber Fever? Learn all about the star in Justin Bieber’s profile! Will Michelle make a good Marilyn?